The Flanged Wheel | Well, come on, what else would I call it? 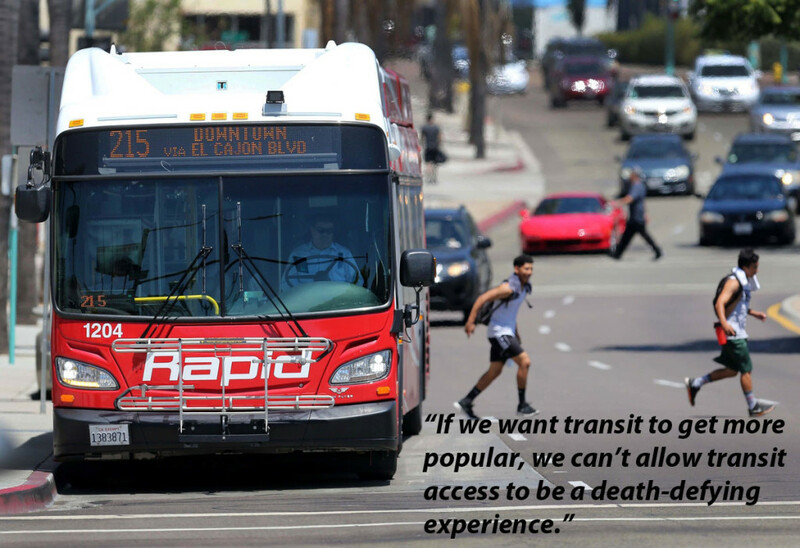 The new Mid-City Rapid isn’t much faster or more dependable than the regular bus it replaced, leaving the El Cajon Boulevard community grasping for the transportation solution it was promised, even while it undergoes a development boom. The article makes it seem like this particular bus line is a failure. The more I read about it, though, the more it seems like it’s less a failure than a project that oversold its benefits. And despite the cost, seems to have been cheaped out at some point. It’s surely not BRT and near as I can tell doesn’t even have rudimentary things like off-board fare collection. MTS claims that the vehicles “were designed to streamline and accelerate the boarding process and feature multiple doors, low-floor designs and larger windows” but multiple-door boarding is not the same has having multiple doors. Sheesh. A lot of money was spent on the half-dozen or so Rapid routes and even their operation was contracted out to Veolia I suppose to make it seem different (and surely to bust the ATU). A lot is still left to be desired, though; like the total absence of exclusive lanes. They do, at least, have signal pre-emption and next-bus signs at stops. BUT … ridership on the route is up 18% since the service replaced the former 15 route in October, 2014. No definitive word, but likely reasons for the increase are that SDSU students trying to get to or from downtown San Diego are saving time, that the route has a long span of service (>20 hours/day), and it has excellent peak/off-peak/late headways (10/15/30 minutes). Implying that this route is somehow a failure misses the mark. Less than what was promised? Yes. Could things be made better? Absolutely. Do we want to look closely at whether it was worth the cost? Yeah, probably not. But please, credit where some credit is due. I think it’s established that I am a fan of the fire service. The service has its challenges, to be sure, and many departments aren’t handling that challenge well, at least in my opinion, but that’s not my point. Here, it was planners that provided the challenge. Lives were not lost in this incident but only by hard work. I guess I should say that it was the developer who didn’t help matters, but somewhere along the way, someone from the planning department signed off on this. When I first saw this the other day, I thought “Man, why didn’t they just throw the stick from the truck? Or at least bring the ground ladders from a closer point?” “Throw the stick from the truck” is Boston-ese for “raise the aerial device from the ladder truck”. Then I looked up the location on Google Maps and found why. In order to get to the roof (to cut holes and vent smoke and heat) or to get to windows (to rescue occupants or get to the seat of the fire), the ladder truck will generally pull up in front of the fire building, drop the outriggers, and raise the ladder to where it needs to go. If there is no access for the ladder truck, then ground ladders are used as in the video. 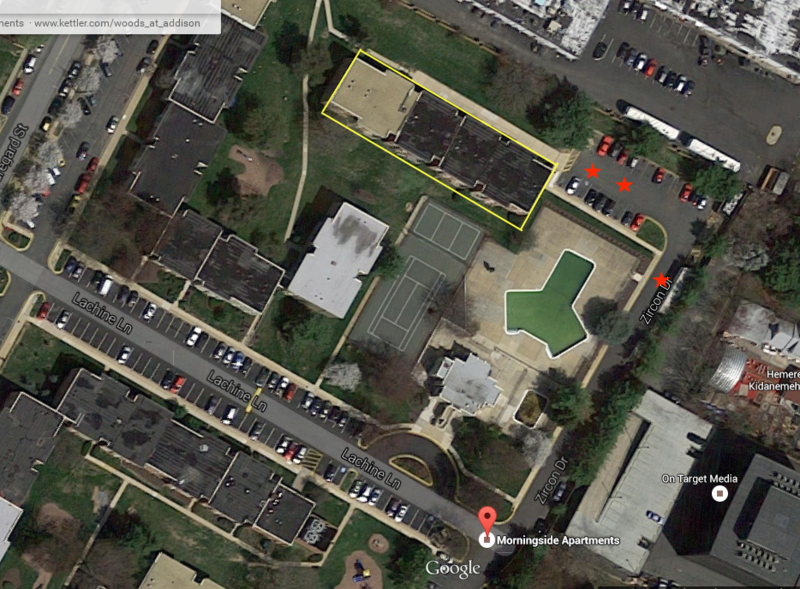 Morningside Apartments, Fairfax Co, Virginia via Google Maps – https://www.google.com/maps/place/Morningside+Apartments/@38.8160455,-77.1433142,120m/data=!3m1!1e3!4m2!3m1!1s0x0:0xdfd9ce54d4e74689 – North is UP. The problem here is that the ladder truck could only get to one single corner of the 200′ x 50′, 3-story apartment. Note that the parking lot does not extend in front of the fire building. Any possible use of the lawn for staging of fire apparatus — which is not always possible where there is no hard surface of any kind — is blocked by a tree. In fact, except for that one corner of the parking lot, there is no vehicular access to the building at all, on any side. The desire to have green space everywhere is one I share. However, vehicular access to all sides of the building must be considered. This vehicle access does not mean having to provide a paved roadway open to all vehicles. It might mean a gravel path (constructed in a way that it would support a 25- or 30-ton aerial ladder truck) with non-emergency vehicle access prohibited. At least one side of the building should have access for vehicles. There are surely recommendations for this type of access somewhere – if you know where, leave a comment and I’ll add a link. Bottom line is that it’s unacceptable to design a complex in such a way that firefighters are forced to carry equipment (and drag hoses) for hundreds of feet from the closest vehicle access point. Nobody died because of poor design in this instance but it’s easy to see how someone could have. These stories keep coming out. Houston just did the same thing. OKC, too. Jarrett Walker says that the community needs to make a decision: is it more important to serve as many areas as possible, or is it more important to increase ridership, with the understanding that neither answer is right or wrong. You can do a little of both but you can’t really have both unless you want to spend a lot more money. Here, Omaha has made a bunch of routes a lot more useful, but they reduced the number of areas served or at best, required longer walks to stops. The time scales for people on foot or bicycle to get to the nearest stop is brilliant. I don’t think I’ve seen that before. OK, sure, this is an excuse to post a video about fire apparatus, especially tractor-drawn aerials. And if into the comments section you go, aside from the pain you will find, there is some criticism that the chauffeur of the tower ladder (the one that doesn’t bend in the middle) probably wasn’t very experienced operating that apparatus. Maybe so. Nonetheless, neither vehicle had much trouble with very narrow streets. Backing out? Yes, but not getting to the fire building. I poked around on the NFPA website but could not find standards for minimum street widths and turning radii that were specifically intended for public streets. In NFPA 1, Fire Code, I did find standards for Fire Department Access Roads in Chapter 18.2.3, but that seems to apply to roads specifically intended for fire department access and not necessarily public streets. Those require 20′ minimum unobstructed width and 13’6″ minimum vertical clearance. The standard leaves minimum turn radius up to the authority having jurisdiction (“AHJ”). Remember, too, that NFPA standards and codes only have legal force when the AHJ says they do because they’ve adopted them as a municipal ordinance. I did find this, though: http://www.nfpa.org/~/media/files/research/research-foundation/foundation-proceedings/next-five-years/wren.pdf?la=en which is a slideshow that talks about meetings between CNU and the Austin, Texas, Fire Department. Not much here, but I probably need to do some more research.